This change has created the need to summarize the old-way graph search method as that is still running – but in the back-end. You though have to memorize and use the below commands to retrieve the results but hey! that is not a rocket science just bear with me for some time. In my last graph search post I was mainly focusing on leveraging FB IDs in the search. Now I am showing you how to use the /str command (and so) to retrieve the most and best of the old keyword-based graph search. Before all, learn this /intersect command. This is the heart of the system! The graph is built on set theory and intersection is the method how it generates results. A set is anything which members have something in common. For example, ‘people who speak English’ is a certain set. ‘People who speak Spanish’ is a different set. ‘People who speak both English and Spanish’ is the intersection of these two previous sets. The /intersect command helps you create the cut (the mutual set) between two sets. T he graph is reading everything in a linear way, always. You have to apply a very simple way of command creation: only one thing after one thing and then intersect them to get the mutual set. Do not try to make it too complex – even if you are searching complex things. The way how you get there has to remain as simple as possible. 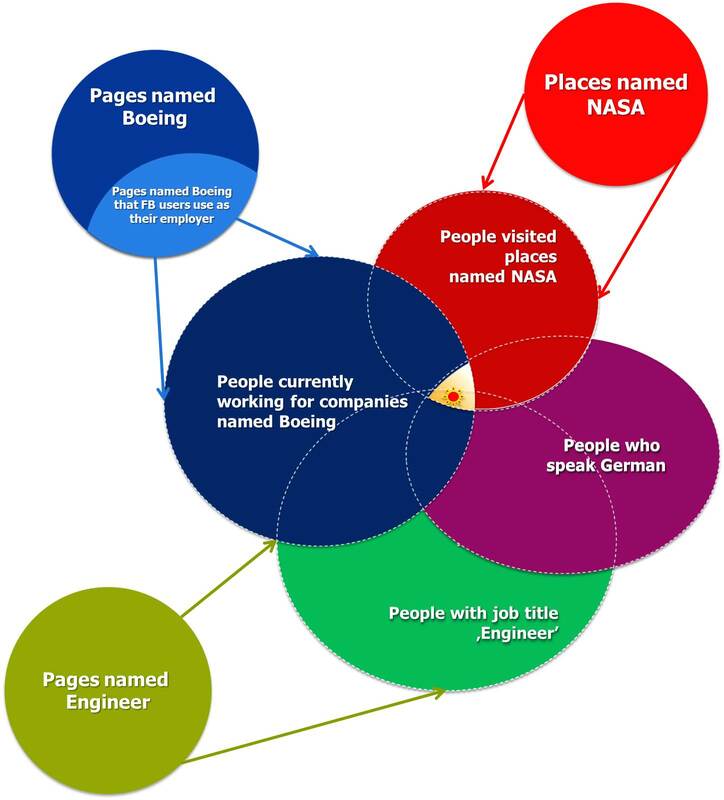 If you apply this logic carefully you will be able to look for cases like ‘people who speak German and are any type of engineers and have ever visited any type of NASA entities while currently working for Boeing’. Its graph is indicated on the left – the target person is marked with the ‘sun’ icon in the middle. Wherever you see two sets being intersected by each other that is where you will have to build in the /intersect command in your URL. If you are running a certain ID-based search you always narrow your results to some specific cases. For instance, you want to find Google employees and run this one: /104958162837/employees/present/intersect where the long number is the Facebook ID of Google. With this search you find only those people who are using this exact (104958162837) Google page as their employer. You miss all the other Google companies that use different IDs. The turnaround can be to use the /str command and run a search like this: /str/google/pages-named/ employees/current/intersect. With this command you get every person who uses Google as a word on their ‘Work and Education’ profile (that can be either their employer or a job title). The basic structure of the /str command is as follows – remember this one, you can use this command in all the cases below! What follows this basic structure will depend on the rest of your query… but let us see some samples below! 1. This is how you find employees of a certain company: /str/your company name/pages-named (as above!) and then /employees/intersect. You can search for current and past and ‘ever’ (anytime) employees by adding the /present /past and /ever commands after the /employees. These are all the current Facebook employees, these ones are the former ones. Note1: we use these commands to locate employer or job title searches, however, Facebook is doing nothing else than looking for these keywords on the ‘Work and Education’ tab under the ‘About’ section. So if someone’s job title contains the word ‘Google’ they will appear in the Google ‘employer’ search. Note2: Facebook is not running a verbatim search. In some cases, Facebook is bringing false positives (aka synonyms). On the right, run a search for prezi with /str/prezi/pages-named/employees/intersect and you will get profiles containing the word ‘presentation’ but not ‘prezi’. 3. Now it is time to combine these two ‘strings’. Pretty basically, you just put together these two commands each after each to get the results. Here you go some current employees from Facebook who are former engineers. These are people who currently work for Osram but are former Philips employees. These guys have worked for both Google, Yahoo and Facebook (uhmmm….most of them are probably fake profiles, what do you think?). This is certainly an obvious and a rather practical search term. Use the /str again like: /str/your language/pages-named/speakers. The fun part is that many developers add the programming language as a real language so you can find people who ‘speak java’ or ‘speak ASP.NET’. Again, you can combine all the above to find people who speak Spanish and deal with android as a current Google employee. This was a very useful filter in the old graph (and I am totally confused why this has gone…). Use the /str to target certain colleges and/or universities and/or just certifications. The way must be already familiar: /str/your uni/edu keyword/pages-named/students. Use it, for instance, to find Cisco engineers like this. Or if you want to make sure these guys are indeed engineers you can combine it with a job title search like this. Note: you can add general keywords, too, to the studies. Use this /str/mba/pages-named/students to get everyone who mentions MBA on their education profile. Or use this /str/college/pages-named/students to get every type of colleges. Regarding the schools another helpful search can be to see all the universities and colleges in a certain location. This is where you can use the /places command. 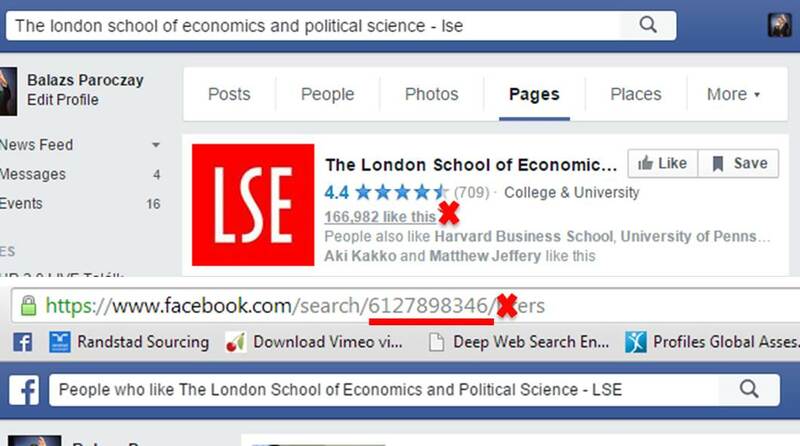 /108051929285833/places/106078429431815/places-in/intersect – this brings every educational institute’s Facebook page out of London, UK. You can also combine the /places with the above commands. This string 108051929285833/places/students/intersect brings everyone who has studied at a college or a university. The long number here (108051929285833) is the general page of College & University that is displayed on every other educational page (see right). Regarding the places I share a hint how to find their ID number in the shortest way as Facebook has made it pretty difficult. Since Facebook has acquired Instagram (and with that: removed Foursquare) I think, people are more open (or simply softly forced?) to check in on Facebook. This is certainly good for searching. By using the /visitors command you can easily check who has been and where – and this info can reveal the professional interest and build the professional profile of a candidate. Another cool command: shows you who has liked a page. It can be very easily used: just add the /likers command at the end of the ID. These are the folks who have liked our Sourcing Centre in Budapest. …or these are the guys who have liked every page named iPhone. The /residents command works as before. You can also combine with the /str command such as /str/your location/pages-named/residents/intersect. Here you identify some Alexander Mann Solutions employees out of Krakow. You can search for groups by using the /groups command. Use this at the end of a string. You can still add /males or /females at the end of your string. Its use is pretty obvious. Hope you enjoyed (well, at least appreciated) this long tutorial – in my next post I will come up with some super challenging real samples (and of course, smart solutions). Happy New Year, Sourcers! May the spirit of the Goat be with you in 2015! Is there a way to use this type of search on a mobile phone with urls starting with https://m.facebook.com ? on a mobile phone without changing to https://m.facebook.com… ? An answer to one of the two questions would help me very much…. you will see that it does show your friends as desired — though it reverts to a mobile browser display and URL. But that shouldn’t matter, since you are getting the desired results! Here’s where things start to vary: A typical FB graph search URL like https://www.facebook.com/search/str/santander/pages-named/employees/present/str/accountant/pages-named/employees/present/intersect will redirect to a mobile URL and render fine in Chrome on iOS but it will not display in Safari. Do you know what the part “rand=1524026836” does? Especially why exactly this number and not something else? Glenn – super good! I checked the mobile link without adding the rand= command and it works perfectly fine (at least on PC). Maybe that’s not needed? then I don’t get the desired result. Instead it shows the mobile UI without search result. Could somebody else try this on an iPhone? Maybe I made a mistake while copying. You could do this with a few different data points and inevitably find the right person. This what I am most frustrated with, with regards to the new graph search. It seems like they closed all the loop holes of what is public. PS. You do not have to add the %20 character if you use two keywords (or more), leave a space there and Facebook will automatically replace the space with %20. Excellent post to clarify how you must modify your Facebook search methods in order to still work vs. your 2013 post on this topic. My only concern is that results still appear to be limited to friends and friends-of-friends (i.e., equivalent of 2nd degree on LinkedIn). For example, I am able to find additional qualifying results from profiles indexed by Pipl.com, TalentBin.com, etc. Do you have any suggestions around that? Hi Glenn – thanks for the comment. I think the results are not narrowed down to friends. The order of the results is, yes, following the friendship algorithm but – as far as I have seen it – not impacting the total results. Did I miss something? Here’s an example to illustrate the problem: I get 4 results for this search (https://www.facebook.com/search/str/sonoma%20partners/pages-named/employees/present/intersect/str/developer/pages-named/employees/intersect/str/united%20states/pages-named/residents/present/intersect), which does not include Miles Hastings (https://www.facebook.com/miles.hastings.5). If there is no 2nd degree limit, shouldn’t he (and all the other US people currently at Sonoma Partners listing a job title of Associate Software Developer) appear in my results, too? Glenn, I checked only on mobile but Miles seems to not mention his location (places he’s lived). Or that info might be not public? If so this can be the answer. There is a lot to digest here Balazs…and I totally appreciate you sharing this data and “how to” tutorial. Yet, what you are sharing makes want to re-think that idea…thanks! I think you are making these searches too complicated. You can still do “regular” searching without a lot of your boolean strings. For example, in the Sonoma Partners search above I would begin with: “people who work at sonoma partners” (omit quotes) in order to get a global search return (this will include your Miles Hastings). Once you get your results you can then drill down: people who work at sonoma partners and live in the united states. Miles is left out because he has not included his location. A global “shotgun” search is always the better option. You can always drill down later. Is there an example you can show me for searching job titles etc on skills rather than companies. I.E. recruiting for Freight Clerks in a set UK location. I wouldn’t want to try and search on all companies i know, but rather people in the job roles i were looking for? Quick question: With the old Graph Search, I would usually use it to search videos and photos posted from particular locations, an ability that has obviously disappeared with the new search. — Video posts about “protest” by people who live in London, United Kingdom (when using keywords). etc. It was a really useful search tool for my job, and I would love to be able to regain this abilty. Have you, or are you planning to write a blog post for help on these searches? It would be amazing if you did. Would also like to know how to find the “from this month” command. I know you can simply search for videos in London, but the video posts option always used to bring up better search results. Thanks a lot for this tuto. I was wondering why some searchs were no more available. Anyway some requests are still ok. For instance : people who live in london and are nurses. hi the balazs, how about find people post about something and they are not my friends? and can u post about whats all the custom url query?? Hi Balazs, I love this! I know that it’s a little more involved than the graph search of before, but if you take the time to learn it, it can be really helpful. I’ve already been tinkering around and keeping my strings by the “subject” so that I can copy out the sections I need and then tweak for location or job title, etc. Please keep digging at this, FB has been a useful tool for our business and I want to keep evolving our sourcing methodologies as it changes. Love these tips. Really appreciate the effort put into explaining everything. Is there a string to find out how many people like a page from a certain location? When FB changed their search algorithms in Dec they made it so you could only effectively search your own, your friends and family accounts. We have also noticed that even the accounts we use to search FB have issues – we can search for the same thing using different accounts and either get a result or no result – for whatever reason it varies between users and their accounts. If you don’t get any results with one account try another one. For your search request “people who like Microsoft Azure and live in Houston” the search I would use is “ users who like Microsoft Azure and live in Houston, texas” FB seems to return better results when you use “users” instead of people. Doing this search I got lots of results for both. If you don’t get any results using this search string try either another computer or a different FB account. You are right about mixing id numbers with the example i listed above – my mistake, I replied before thinking : / However, the id searching does work but only for specific strings. Balazs is correct in saying FB doesn’t list numbers but social bakers will. Hi Mark. Per my last info the tool is still working and bringing results. Give it a try! Thanks for your reply. Appreciated. I have tried to use the tool but it may be me not understanding the search strings to use. For example, I am trying to search for a Field Services Engineer in Perth, Western Australia. The Field Services Engineer search alone brings up a few people across the globe. However I’m struggling to understand the “AND” button function and how I can incorporate it into my search. I’ll have another read of the blog above and give myself a slap if I work it out. Mark, you want those who currently live in Perth (that is all you should type in first field, selecting “Lives” in menu – don’t add Australia or anything else) and who have *ever* had the job Field Service Engineer (it appears FB also returns results that say Field Services Engineer with that), so that goes in a second field with “All Jobs” selected in menu. You get plenty of good results from that! What about the search I used to be able to do with Graph Search, “Pages liked by people who like [your organization]”? Is there a way to replicate that now? Balasz, thank you so much! You have enabled me to tell my nonprofit clients what their supporters are interested in besides the nonprofit itself, and that will give them a much better sense of what they should be writing about in their blogs, emails, social media, etc. I’ll be giving you full credit in my Communicate! blog on Monday. It’s http://www.dennisfischman.com, in case you’d like to see it. Thank you, Dennis! Much appreciated. Glad I could support you. But now it’s not working! Has Facebook closed that search down, Balasz? I hope I’m not taking too much of your time, but could you try it with the ID 146980652019799? Never mind. I rebooted and it worked. It doesn’t work for me – and nor do most of the links above. I don’t get it…? Are Facebook changing this? Or is there something I’m missing? I tried the search tool and a basic one such as “Speaks” and “Spanish” – but nothing. Hi Andrew – if you try this link it works fine for me: https://www.facebook.com/search/str/spanish/pages-named/speakers/intersect did not you forget to add the /pages-named operator? That is a usually missed element. Balazs, how to combine these two queries? you may have a fantastic blog right here! would you like to make some invite posts on my blog? What is your blog, Hubert? Hello Balazs, do you know if you can search for people by their “Race” such as African-Americans who live in Miami…. Hi Jas – I am unsure whether FB would track this info about us. At least I cannot recall this was asked when registering to the network… But if this is something users can add to their profiles then it should be searchable. Understood and thank you for your prompt response! thank you for sharing but i was wondering, is there a way to exclude a category of people from your search? something like -pages names google . Something like that , i hope you understand my question . Hello, as per I know you cannot have a NOT syntax in graph search.